Clock is ticking. Soon the New Years will be here. But before it happens, let’s take a moment to revisit CuteCoconut in 2012. 2012 opened with full of hope. I was at the top of my spirit, running toward my goal to make this a successful blog. We just settled in a new country and it was a new beginning all the way. I had just started my wonderful journey with Mom Blog Society and was in fire. But unfortunately the fun was short lived because I had been cut out of internet connection for quite so long. What can you expect after moving between two country? And then in the middle of this year we were again moving out, this time back to our home country. Once again I was out of the game. Until recently I finally find my grip back and ready steady to welcome 2013. I did score some paid gigs from my blog either within the blog (post, ad space, etc.) or offline but related to my blogging world. However it hasn’t been as big as I want it to be hence the strive continues. Now, coming on to my resolutions for 2013…. To be honest with you I am one of those who don’t have a faith for resolutions. In my opinion resolutions are just like some rules, and rules are meant to be broken. Or aren’t they? But that was last year. From time to time I used to write resolutions until one day I realized I was never able to keep up with it. By mid of January I already forgot half of my resolutions and when January ended, so did my resolutions history. What makes a difference now? Now I have a red alarm ringing in my ear. I am not 30 anymore. That was some two years ago and I see my life goals have only been half achieved. I haven’t been an established writer. Almost every year for the past three years I have said to myself “this year I am going to write a book”. Never happened. Until couple weeks ago, when I took the courage to self-published my Saturday Mind series in a form of eBook called Mom Think Tank – a ballad of stay at home mom. I haven’t gone big yet and one of my resolutions for 2013 is to properly launch this book. Personally, my resolutions in 2013 are to be a better and slimmer mom, wife and person. What are your resolutions for 2013? If you have written a post about it please link up here. Otherwise you can shoot it out on my comment field. 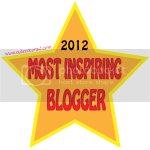 *Some of the resolutions will be featured on my first Newsletter in January 2013. If you haven’t subscribed please do so HERE. Don’t worry, it won’t stuff your inbox, I promise! Awesome resolutions and they are all very attainable!!! Hope you have an amazing 2013!! Hi Rina! I like how you have a nice, structured list of resolutions that seem very doable. May you have a successful year ahead of you, and may you be able to make your resolutions come true. Good luck! Those are some fabulous goals to work towards. I started this year out hoping to grow my blog bigger than what it is, but have learned that it is a steady process, and there is always room for growth. I am happy at the pace I am chugging along at, but do hope to grow even more next year. I love your goals. My goal is to finish my book, write at least 275 new articles, and finish my book. I have a big year with a move in the middle so I am going to prepare early and accomplish my goals. Love your goals for the new year!